Additionally, with Hearthfire installed, a grindstone can be added on the outside of each house built, in the cellar additions, and in armory wing additions. Occasionally the graphic for the use of a grindstone may be messed up. 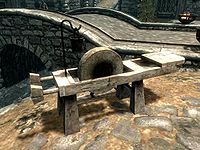 In such situations the individual using the grindstone is sitting too far forward or backwards, and the weapon will clip through the stone or will not touch it at all. This is merely cosmetic, and can be fixed by standing and sitting on the grindstone again. This page was last modified on 3 June 2018, at 18:11.